"OH, give thanks unto the Lord; call upon His Name; make known His deeds among the peoples." Psalms 105:1. In South Africa the Word of God was with power to manifest all manner of 'signs and wonders' among the people. The Bible says, "The fool hath said in his heart, there is no God." (Psalms 14:1). Of a Truth a man would indeed be a fool to say 'there is no God', after witnessing the ministry of William Branham among the people of South Africa. For such was the nature of the ministry that it was beyond human imaginations, mental telepathy and ESP. The Word was manifested in power not only to discern the thoughts BUT also the very intent of the heart of man. The Past was exposed; the Present was uncovered and the Future was Revealed. Writters and historians are at a lost for words to express what God did throught His Servant and Prophet in South Africa. One writer, making a report of some of the meetings, said, "One would like to have supernatural words to express the supernatural ministry of the Lord among the people." Why Did William Branham Go To South Africa? At this time in his ministry, William Branham, would on a daily basis receive countless numbers of prayer requests from all over the world. Many times airplane tickets would be included with the requests. 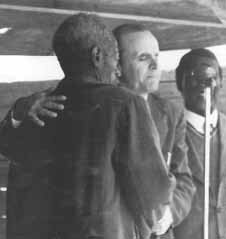 It was one of those requests that caused Brother Branham to made it a definite matter of prayer concerning a Campaign in South Africa. He had considered it before, but the Lord had always directed him to go elsewhere. But in 1951 the Lord definitely led him to Africa - This was God's time for Africa. The prayer request mentioned above was from Florence Nightingale of Durban. Her testimony is tremenduous testimony to the Power of the Living God. Dying of cancer and weighing only about fifty pounds, she sent word to Brother Branham, requesting that he would come to South Africa to pray for her. Included with her request was her picture and a plane ticket. At the time this request reached William Branham, he was conducting meetings in Houston, Texas. On the same evening that the Halo Photograph was taken, Brother F. F. Bosworth showed Brother Branham the picture of Florence Nightingale and the ticket. That night in Houston they prayed for her, promising God that if He would heal her and make her completely well, they would take it as a sign from God that they should go to South Africa. In His own "mysterious" time and way God answered prayer - Florence Nightingale was completely delivered. There was no mistake about it - William Branham knew that now was the time for Africa. Plans were made to conduct the African Campaign during October, November and December of 1951. The greatest religious meetings ever held in South Africa were conducted during this time. Without fear of exaggeration, we can say that hundreds of thousands were touched by this move of God in Africa. Yet in spite of the Great Anointing and countless blessings the people of South Africa experienced, God, at one point had to step in with judgement when some of the ministering brethren failed to obey "Thus Saith The Lord" in the mouth of His Servant and Prophet, William Branham. This will be explain in detail in the 'link' below which will take us to the "Full Report" of the South African Campaign. So great would these meetings be that the Angel of the Lord who had appeared to Brother Branham in 1946, told him that a 'report' should be written of the meetings in South Africa. The Brother chosen to do this was Julius Stadsklev. His book entitled, A Prophet Visits South Africa gives a detailed account of the Wonders which God performed through His Humble Servant in South Africa. "Click" the above link and come with us as we follow "A Prophet Through South Africa.